Recently I told you about Leo, the least weasel baby I had found in late summer. He couldn't be released into the wild last year because it was too late already. We have to wait until May. In the meantime Leo is living in a cage in the living room. After he had outgrown his 'baby'-box I wanted to give him more space in a cage that I could easily move around. At that time I still thought to release him in a few weeks and in preparation for this I wanted to move him into the garden for a few hours daily to make him learn what rain is, what sun and storm and night. I got an old wooden cot with castors to which I mounted a top cover from slats. I lined it with a fine mesh. 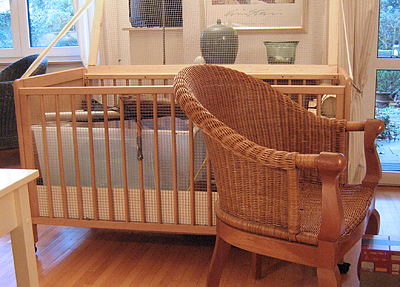 Inside this cage I put the baby box, a long piece of a tree trunk, some shelves, boxes and tubes from paper towels. Already with his first box I decided to let him stay in contact with bacteria from the garden. Soil, sand, gravel, stones, old and fresh leaves, grass and pieces of wood from my organic (!!) garden instead of shop bought litter. When he moved into the cage and discovered he could leave his baby box and had a lot more space to run and jump around, he squealed with glee. Not a piece of beauty: Leo's cage. Here with the top cover open and a wicker chair and a small stair from cardboard boxes in order to get back into it. When it turned out that Leo couldn't be released last autumn, it became clear too, that this cage – intended as an interim solution – would be too small for him for the months to come. In the wild a male least weasel's hunting ground is around 1,5 ha (= 15.000 m² = roughly 161,500 sq ft). Leo's muscles need to be fully trained to cope with such spaces. This was impossible to achieve in his cage. He needed to run longer distances. After thoughtful consideration I decided to let him run in the living room. All windows and doors closed, all harmful decoration removed, nobody but me (without shoes!) in the room, Leo completely seizes this room from top to bottom during a few hours each day. Least weasels sleep around half of the time. Their sleep-wake cycle is irregular but they are active night and day, even a bit more at daytime. Leo sleeps around three to four hours, then he's awake for more or less the same time, being extremely active with small breaks in between. These intervals are not consistent, but I can't figure out what they depend on. 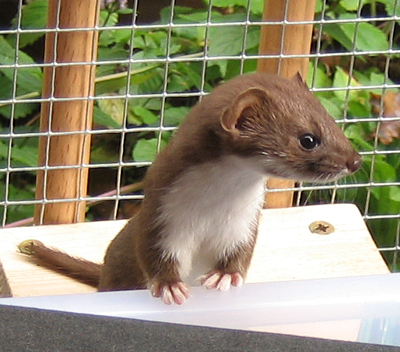 When Leo is active he is somewhat hyperactive, as least weasels are. He climbs up the curtains, jumps from wicker chair to wicker chair and runs across the room like lightning. (That's why it's so hard to get good photo shots.) He especially loves the sofas because he has a good grip on the cloth and there are cushions and blankets under which he can hide. In the wild an adult least weasel would be busy all time preying on food. Leo gets his food from me and in his spare time he wants to play. He fights with my hands and fingers, preferably when he is hidden under a blanket, which is good for me because his teeth are really sharp. He tries to catch whatever I have, pieces of leather (his favourites), knotted pieces of fabric, crumbled pieces of paper and of course, his toys. Typical least weasel, whatever he catches, he immediately carries it off and buries it in one of his hiding places, behind a cushion, under a blanket, behind a book shelf, in a tube or in a drawer. Into the drawer he gets from somewhere under the chest, although I don't know how he does it. It looks extremely funny when he's lugging a piece of knotted fabric that is four times as large as he is. And because Leo is a least weasel who in the wild mainly feed on voles whom they follow into their underground tunnels, he creeps into everything he fits in. He creeps into tubes of course, but also under a turned over newspaper, into vases and into the sleeves of whatever I wear. However, Leo gets his food in his cage only and I want him to sleep there too. He loves blankets and if I would let him, he would prefer to sleep under a woolen blanket on the sofa. But with the help of his toys it's easy to get him back into his cage. That's when we get back our living room. that little fellow is so cute! they always look curious and lively! years back I had a hedgehog as winter companion and he always dashed under the furniture, where I had to "dig" him out again to get him back into his cage. but hedgehogs are rather "simple", I suppose Leo will keep you on your toes much more! aren't you worried that he might not be able to feed himself when freed? Sorry for answering so late! Yes, I'm extremely worried that he will not be able to cope with the wild. He is afraid of humans, which is good, but he is not afraid at all of my cat!! I've planned to move his cage into the greenhouse in May. When he is used to it I will make a hole into the wall and build a cage on the outside in which he can get used to everything under the sky. Then, after some more time I will open the outside cage. I know that I will stop sleeping well from that moment on. I will go on feeding him. I don't know at all whether it is possible to keep him like this, with food and shelter supplied but giving him all the freedom he wants.